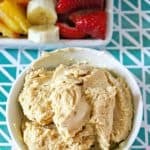 This yummy peanut butter dip goes perfectly with fruit or crackers. It is easy to make and will be the hit of your next gathering. Pour an entire 7 oz container of marshmallow fluff into a large bowl. Add a block of cream cheese cut into cubes into the bowl with the marshmallow fluff. Add ¼ cup of instant vanilla pudding mix and ¼ cup of powdered sugar. Next, add ½ cup of creamy peanut butter. Mix well. It may be hard to stir the ingredients at first, but once you start, the mixture will soften quickly. Slice up some fruit to go with this yummy peanut butter dip.